Citation Information: J Clin Invest. 2017;127(5):1664-1682. https://doi.org/10.1172/JCI88502. Duane retraction syndrome (DRS) is the most common form of congenital paralytic strabismus in humans and can result from α2-chimaerin (CHN1) missense mutations. We report a knockin α2-chimaerin mouse (Chn1KI/KI) that models DRS. 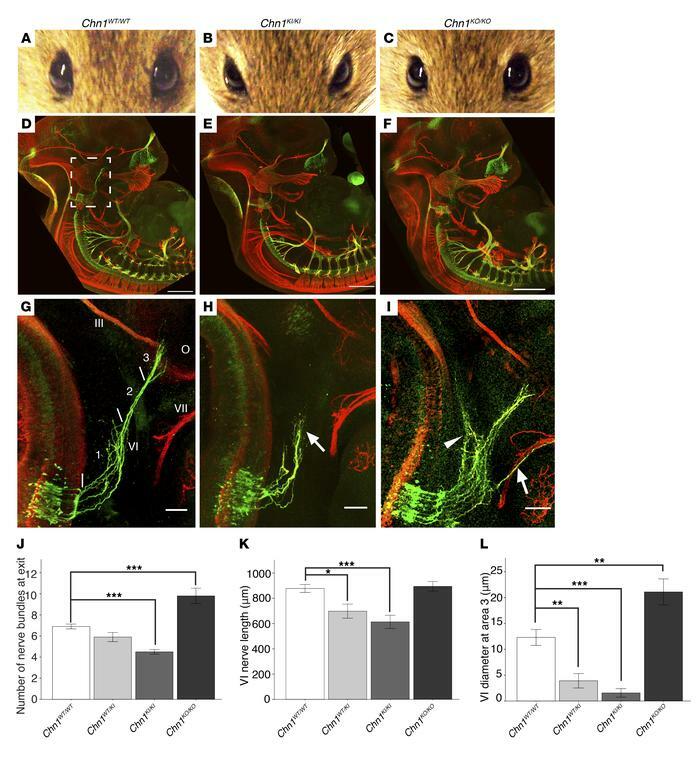 Whole embryo imaging of Chn1KI/KI mice revealed stalled abducens nerve growth and selective trochlear and first cervical spinal nerve guidance abnormalities. Stalled abducens nerve bundles did not reach the orbit, resulting in secondary aberrant misinnervation of the lateral rectus muscle by the oculomotor nerve. By contrast, Chn1KO/KO mice did not have DRS, and embryos displayed abducens nerve wandering distinct from the Chn1KI/KI phenotype. Murine embryos lacking EPH receptor A4 (Epha4KO/KO), which is upstream of α2-chimaerin in corticospinal neurons, exhibited similar abducens wandering that paralleled previously reported gait alterations in Chn1KO/KO and Epha4KO/KO adult mice. Findings from Chn1KI/KI Epha4KO/KO mice demonstrated that mutant α2-chimaerin and EphA4 have different genetic interactions in distinct motor neuron pools: abducens neurons use bidirectional ephrin signaling via mutant α2-chimaerin to direct growth, while cervical spinal neurons use only ephrin forward signaling, and trochlear neurons do not use ephrin signaling. These findings reveal a role for ephrin bidirectional signaling upstream of mutant α2-chimaerin in DRS, which may contribute to the selective vulnerability of abducens motor neurons in this disorder. Chn1KI mutations are gain-of-function and alter abducens development. (A–C) Eyes of Chn1WT/WT (A), Chn1KI/KI (B), and Chn1KO/KO (C) adult mice (Chn1WT/WT: n = 0/44 affected; Chn1WT/KI: 61.3% affected, n = 144/186; Chn1KI/KI: 71.8% affected, n = 28/39; Chn1KO/KO: n = 0/9 affected). (D–F) Whole mount neurofilament staining of E11.5 Chn1WT/WT (D), Chn1KI/KI (E), and Chn1KO/KO (F) embryos. Scale bars: 500 μm. White box, enlargement in G–I. Scale bars: 500 μm. (G–I) Developing abducens nerve (VI) in E11.5 Chn1WT/WT (G), Chn1KI/KI (H), and Chn1KO/KO (I) embryos. Arrow, stalling region in H or aberrant fasciculation with facial nerve (VII) in I; arrowhead, dorsally projecting nerve bundles. Area 1, abducens hindbrain exit region; area 2, abducens fasciculation region; area 3, abducens EOM innervation region. III, oculomotor, VI, abducens, VII, facial nerves; O, orbit. Scale bars: 100 μm. (J–L) Number of abducens nerve bundles immediately after exit from the hindbrain within area 1 (J); abducens length measured from hindbrain exit to nerve terminus at the orbit (K); and abducens diameter measured at line denoting area 3 (L). Chn1WT/WT: n = 20/20 nerves reach orbit (n = 10 embryos); Chn1KI/KI: 3/10 nerves reach orbit (n = 5 embryos); Chn1KO/KO: 10/10 reach orbit, 7/10 nerves fasciculate with the facial nerve (n = 5 embryos). Data represent mean ± SEM; *P < 0.05, **P < 0.01, ***P < 0.001, 1-way ANOVA with Tukey’s test. Red, neurofilament; green, Hb9-GFP (26).